On the coastline of Ocho Rios, Jamaica is a glamorous all-inclusive resort which boasts its very own namesake private island! Couples Tower Isle is located on 19 acres of beautiful wide sandy beach with sweeping water views. 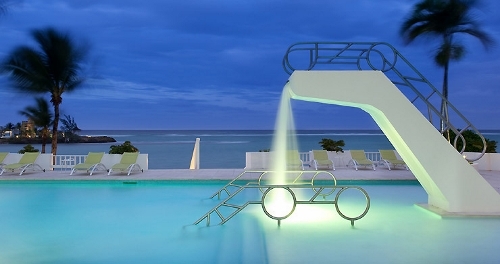 AND if you book by July 31, 2012, you can enjoy a "complimentary spa treatment every day " PLUS savings of up to 52% . . .
- Air-conditioned fitness center, with state-of the art cardio equipment. - Shuttle to Island Village, home of Jimmy Buffett's "Margaritaville"
Enjoy a complimentary treatment every day at Couples Tower Isle in the Oasis Spa when you book by July 31, 2012.